Every time I think I'm finally done buying Trash Pack figures, Moose Toys comes up with something new to hook me back in. 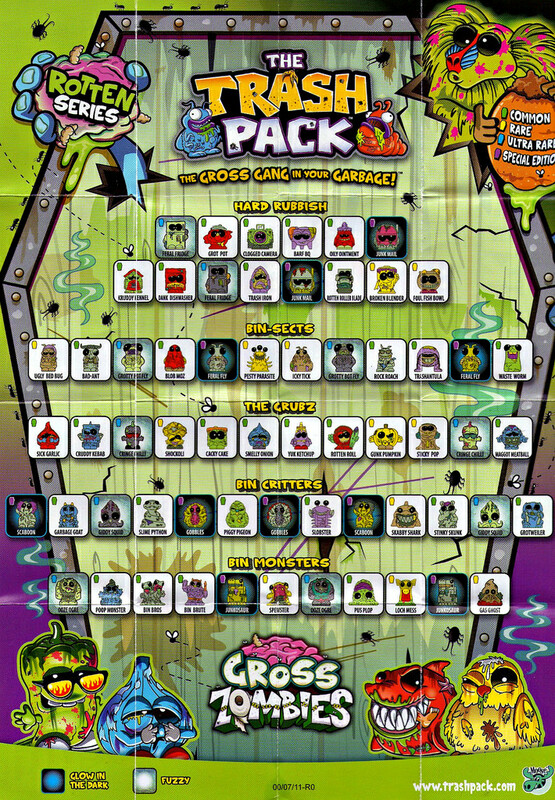 Last year it was the Gross Ghosts series, and now it's a new set called Gross Zombies. 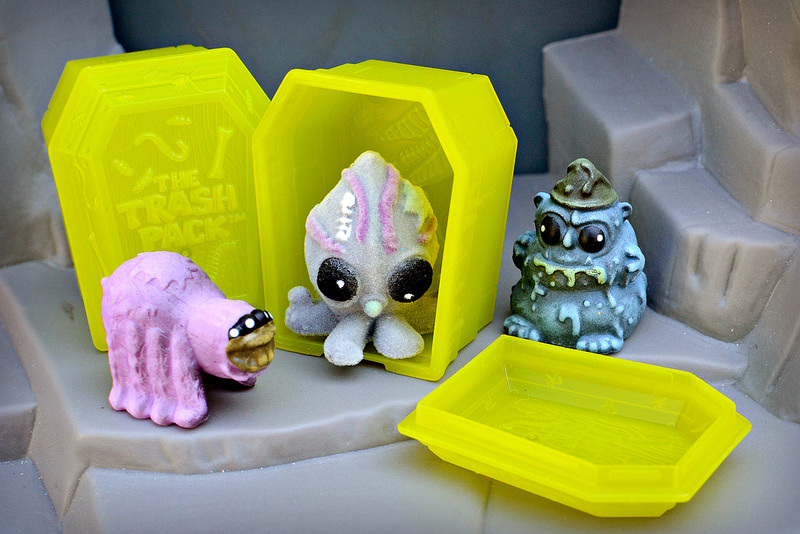 Like the Gross Ghosts, the Gross Zombies are not completely new figures, but rather a fresh take on past figures from the Trash Pack line. While the Gross Ghosts series consisted of transparent versions of classic Series 1 and 2 figures, the Gross Zombies offer up zombie-fied takes on classic Series 3 figures. The figures are made to look zombie-like though eerie paint jobs with darker tons, and colors that are more a bit more drab than usual for Trash Pack toys. I'm not sure if that's the right word, because these figures are still colorful; they're just not as bright and vibrant as Trash Pack figures typically are, to give them a spookier effect. This time around, the special figures from the set either have a fuzzy exterior (the Ultra Rares) or glow in the dark (the Special Editions). Another notable thing about this set is that instead of the usual trash cans, the figures are packed with really cool translucent yellow-green coffins for storage. As usual, the containers come in two sizes, with the larger ones being available in 12-packs and the smaller ones being available in 12-packs and 5-packs. I really like the looks of these, and they're timed nicely considering Halloween is coming up soon. Once again, Moose has made one of the coolest Trash Pack releases yet simply by rethinking a previous series. What do you think? 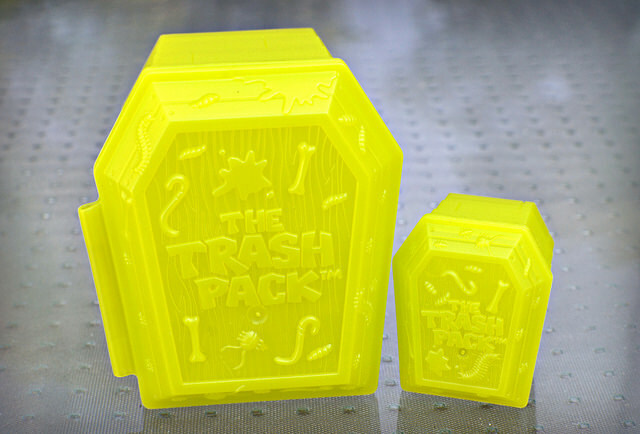 Have you bought any Trash Pack Gross Zombies yet, or do you plan to? I keep thinking i should buy a few of these Trash Pack toys but i haven't done it just yet. If you decide to, I recommend starting with either this Zombie series or the Ghost series. They are the coolest-looking ones. I think i will try the Ghost ones first when and if i do. Definitely. The paint apps and coffins make these pop. I kept telling myself that I would not buy Trashies, I have to limit my collection somehow. Well, I purchased my first Trashies and I love them! I think the Ghosts and Zombies sound a bit cooler though, so I will try and stick to them from here on out. I haven't seen any yet, I didn't even know they existed, so thanks for sharing! Which series did you get? Also, just FYI the Ghosts are exclusive to Target and the Zombies might be too (not 100% sure), so that's the place to go to look for those. I got one blind bag that came with a figure and some magnets, and a Trash Pack Wheel Bin. No wonder I didn't see the zombies, I was at TRU. I will keep my eyes peeled the next time I visit Target. Thanks!